It’s a new season and a new day, so if you’re seeking inspiration to help you step into the best version of yourself here’s a book for you! 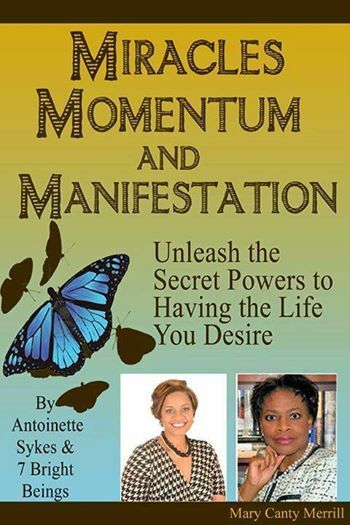 In an empowering anthology, co-authors share their super successful Miracles, Momentum and Manifestation concepts… as dynamic and transformational experts – all leading to a better place in what we call an intentional LIFE! The stories here fill their mission and message, which is paramount to other women, leaders, professionals and other entrepreneurs during this time. Advance Praise: ~ TR Stearns This empowering writer shares with you exactly what miracles, momentum and manifestation mean to her… those improbable events that defy the laws of science and nature, which surpass all human logic because they occur through Divine intervention. She is a beautiful example of gaining momentum in a life challenge… the strength and forward movement that compels and propels her to higher ground. There is no doubt of her manifesting a life shift… showing physical evidence of the seeds she planted and the things she desired for her life. DR. MARY CANTY MERRILL has spent more than 25 years motivating and inspiring audiences across the country to step out of their comfort zone and into their personal power. In addition to entrepreneur and psychologist, she is blessed to serve humanity in a variety of roles. As an educator, facilitator, speaker, author, and life strategist, she is known for her thought-provoking messages, high-energy delivery, and dynamic work in unleashing human potential. She partners with numerous Fortune 500 companies, government and non-profit agencies, educational institutions, individuals, groups and communities to inspire new levels of confidence, productivity, performance and success. To stimulate fresh insights and transformative life experiences, Mary is intentional about continuous self-improvement and is a regularly featured guest on radio talk shows. She is also the co-author of an anthology, The Daughters and Spirit of Harriet and is currently working on her third soon-to-be-released book, Realm of Revelation. This entry was posted in Depression, Overcoming Depression, Self-Esteem, Self-Transformation, Spirituality and tagged books, change, development, inner peace, inspiration, life journey. Bookmark the permalink.